A theatre production with a gallery setting. Two men. Six women. Drink. Dance. Desperate loneliness. What begins as innocent banter over cocktails at an art opening quickly transforms into fantasy, nightmare and possible redemption. In “The Human Variations’” four movements (Allegro, Largo, Scherzo and Rondo), characters collide and share intimacy and closeness, while their small, seemingly innocuous everyday interactions become more and more exposed, shaping who they are and what they obsess about. Allegro, Largo and Scherzo were originally produced as individual workshops in three separate site-specific locations in New York City. The full Symphony, “The Human Variations,” includes the premier of Rondo (the fourth and final movement). 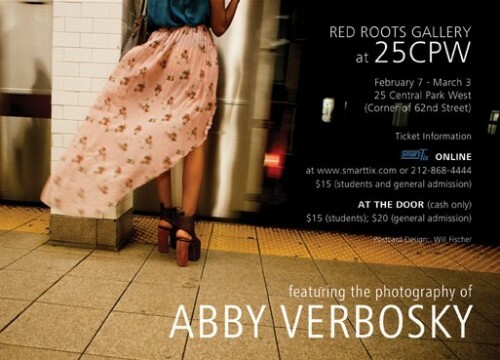 The backdrop for “The Human Variations” is a photography exhibit featuring the work of Abby Verbosky. Audience members are encouraged to view the artist's installation before or after the production. Free wine will be served. Directed by Ellen Orenstein (Co-Artistic Director, Blueprint Theater Project), the cast of “The Human Variations” includes: Kyla Deichl, Molly Groome, Nick Hepsoe, Cole Johnston, Sarah King, Jillian Mason, Melissa McNerney and Zac Walker. The production team for “The Human Variations” is Toby Jaguar Algya (sound design), Devon Brown (lighting design), and Anna DeMers (choreography). Scheduled February 7 through March 3, “The Human Variations” has a performance schedule of Thursdays through Saturdays at 7:00pm and Sundays at 5:00pm at the Red Roots Gallery (25 Central Park West, at 62nd Street) in Manhattan. Pre-sale tickets are $15 if purchased through SmartTix (212-868-4444 or www.smarttix.com/Show.aspx?ShowCode=HUM2 and $20 general admission and $15 students for day of tickets at the door (cash only).